We see frequent evidence of confusion, about abuse classification etiquette, in Blogger Help Forum: Get Help with an Issue. 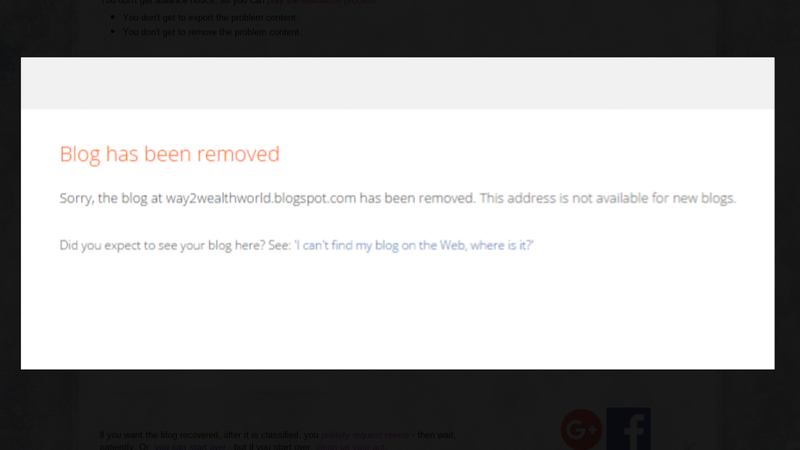 My blog was deleted, as spam - but I received no notice or warning! How could Blogger do such a thing? This indignation may be provided, in the hopes that Blogger would relent. But such reaction is seldom seen - and when seen, is not a result of attitude, but of content. You don't get advance notice, so you can play the evaluation process. You don't get to export the problem content. You don't get to remove the problem content. You don't get advance notice, so you can export the problem content. You don't get to export the problem content - then start a new blog, or export to WordPress. Blogger will not play 3 Card Monte with you. You don't build content and reputation, based upon efforts of millions of blog owners who play by the rules - then setup a new Blogger blog, or a WordPress blog, when you are caught. You don't get advance notice, so you can remove the problem content. You don't get to remove the problem content - then have the domain whitelisted, because it contains no problem material. 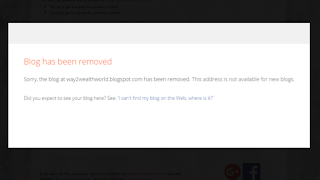 Blogger does not whitelist blogs. If your blog is repeatedly classified, restored, then classified again, you figure out what feature or technique is a problem. Then you remove the problem feature - or cease using the problem technique - while the blog is restored. Blogs that cross the line are classified, and locked. If your blog crosses the line, it will be classified, and locked. This is how abuse classification works. 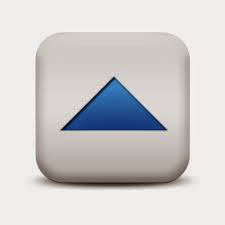 You may get email notification - but that is sent, on a best effort basis. This is the only notice, that will be seen by many blog owners. If you want the blog recovered, after it is classified, you politely request review - then wait, patiently. Or, you can start over - but if you start over, clean up your act. For best results, avoid marginally abusive practices. If you do not appreciate this policy, you learn to publish politely, and improve proactively. Respect the efforts made, by other Blogger blog owners - and don't help make Blogger into a reputed haven for abusive activity. Millions of Blogger blog owners have no problems with abuse classification, because they don't publish abusive content, or use abusive techniques, to gain readers and traffic. And avoid semi dodgy practices, which tend to blur the boundaries, and cause incidental spurious classifications. You can do the same. Be part of the solution - not of the problem. Now, work on your blog - and accept your limitations. Great article...but... when people want to learn, they need to have the explanation. Maybe: I loaded the blog too often to see if the gadgets I put on the blog were working and showed up at the right place? In the meantime I've learned that that gives "pings". Maybe that's the problem? But why can't Google, who knows everything, not know it's just me watching, they can see I'm logged in at the blog. I used a premade template... maybe there was something in it? Why not give me while building my blog a screener? I used one in the past outside blogger, but it's outdated. I can't come up with any other reason. I only went to a friend's blog and posted there in the comments, and I looked up memes, as I love blogmemes. So it's nice to ask me to politely appeal....as it's an automatic appeal and I can't write anything, not even an "hello" and "have a nice day". All I hope is that the copyright service worked and the article I wrote is stored there. All valid points - and all been discussed, already. You could answer a few of your questions, reading the FAQ. 99% of the blogs classified are righteous classifications. Spammers will not appeal - but if "advance notice" was given, they would simply accept the notice, move their spam to another blog, and wait to get advance notice there. It would be an endless game of "Follow the Queen". So, Blogger levels the playing field, by deleting or locking immediately, and expecting that those who are genuinely not guilty will appeal, and give them a chance to tune their filters. Anyway, if you care to state the URL of the blog, in the forum topic that you started, I'll see what I can find out about your spurious classification. But nobody is a mindreader - and right now, nobody knows the URL of the blog.